Rapidly tapping the key can result in a nice fully manual tremolo effect. Having full manual control over the rate of the cut means the effect can achieve unique sounds. The tremolo does not have to be set at a predetermined rate, nor does the pattern have to be of the traditional type. Knowing Morse code can yield fun, creative “patterns.” Being a hand controlled effect, there are more benefits than being foot controlled. A tremolo rate can be tapped while manually ramping the speed up or down. Placing the device on top of your amp directly before your amp input is a good place for it. When standing in front of your amp, you can get some fun feedback and chop that up with the Telegraph. It sounds even better with your favorite fuzz or OD! 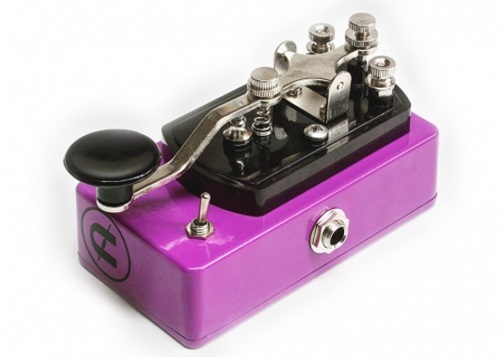 The Telegraph Stutter is hand made in Easton, MA by CopperSound Pedals.